This was my address to the Delegates, Staff, and Guests at our DSEA Representative Assembly on March 17, 2018. Time. As I travel up and down the state to talk with our members, I’m reminded of what is most valuable to them. Time. Planning time. Time with friends and family. Time to meet the needs of all students. Time to grade papers. Time to relax. Time to watch a movie. Time to exercise. Time. Time. Time. And as we sit here today at our annual Representative Assembly, I know that the time you all have taken to do the business of our Association is valuable time. And, to that end, I’d like you to know that it’s my goal to respect your time and keep it short because, as a half-Irishman myself, this is indeed a day to celebrate. So, to those who do, I offer you a hearty Lá fhéile Pádraig sona dhaoibh! : Happy St. Patrick’s Day. I want to say thank you for spending your time today with some of our Association’s most active union members. Since I started in this new role eight months ago, I’ve been bowled over by the support from our wonderful staff here at DSEA as well as the 13,000 members we represent. And time seems to be an issue for everyone. In my 50+ school visits since the beginning of the school year, time is all I hear about. From the AP Language and Composition teacher at Mt. Pleasant High School who’s always looking for more time to share great works of literature with her students to the special education teacher from West Seaford Elementary who’d like more time to complete her required IEP paperwork. From the paraprofessional at Love Creek Elementary who wants her students to have more one-on-one time and resources to the music teacher at Elbert-Palmer who wishes his students could have more time playing instruments as opposed to taking standardized tests. From the food service worker at Old State Elementary who wants more time to share union information with her 10 coworkers to the secretaries across the state who want to make sure they’ve got the time during the day to simply stop and breathe. From the bus drivers and bus aides for whom TIME is certainly most important to ensure their students arrive on time to the custodians who make the best use of their time to get everything done that needs doing to keep our buildings looking great for staff and students. Time. It matters. And, while we are always at a deficit of time to get done everything that needs doing, our members do their best to maximize the time they have to ensure our students get what they need to succeed. However, friends, I’m here to tell you that time is not on our side, regardless of what the Rolling Stones may have told you. Last year, my predecessor, Frederika Jenner, told you the wolf was at the door in regards to policies coming down from the frightening administration of Betsy DeVos at the US Department of Education. Frederika urged us all to pay attention and be vigilant. Well, I’m here to share with you that we will have to be vigilant in the coming months as the greatest threat to our Association is handed down by the United States Supreme Court in the form of the Janus case. Now, I will not bore you all with the details of this case. You all are among the most active members of our Association and my guess is most of you have found the time to learn more about this case. In short, the current make-up of the Supreme Court will likely chip further away at the rights of public-sector unions. Have no doubt – this will impact our membership and could very well impact how we deliver service to our members. This Supreme Court case is called Janus, named after the plaintiff, Mark Janus, a home health care worker in Illinois. Mr. Janus believes that if you don’t want to pay fair share fees to your union, you shouldn’t have to, EVEN IF you benefit from the work the union does. In essence, when this Supreme Court decision comes down, it could create a new generation of worker that expects and demands union representation and benefits, but will refuse to pay for them. But Janus also means something else. Several months ago, while toying around on the Internet, I Googled “Janus.” Did you know that Janus is the Roman god of endings, new beginnings, transitions, and, most appropriately, time? Janus is often depicted in mythology as having two faces. I equate these two faces to the two choices we have as an Association. Do we twiddle our thumbs, look backwards, complain, and cry when the Supreme Court hands down a decision that, in the long run, could cost DSEA thousands of members? Or – do we look forward? Do we pick ourselves up and fight back and show our members who we really are here at DSEA? That we are going to work harder than ever to ensure they see the value in the work we do? That we are going to continue to drive the narrative that our working conditions are our students’ learning conditions? That we are going to continue to fight for more resources for our most impoverished students – for our students with disabilities – for our English language learners? That we are going to continue to push back against bad education policies that focus more time on testing and less time on authentic learning? It’s when we show our members as well as the public that EDUCATORS are the best advocates for students that we win the narrative. And when we win that narrative, we will never have to worry about members leaving us – because they will see themselves in the work we do. Have as many meaningful one-on-one conversations with members as you can. Get them to realize that their voices are amplified in environments where collaboration is fostered and open dialogue is promoted and that our union is a critical driver in those conversations. If you’re a local that has faculty meetings in your buildings every month, check your contract to see if the Association is given five or ten minutes of each faculty meeting to share updates. And use that time at EVERY faculty meeting to share with members – and non-members – how critical union membership is with the wolf constantly knocking on our doors. Go to the Dollar Store. Get a 20-pack of generic greeting cards. Write notes to your elected officials and school board members thanking them for their support of public education and sharing with them how and why unions ARE always a great partner in moving education forward here in Delaware. Finally, and most importantly, share your story. Share it with friends. Share it with family. Share vignettes on social media of why we do what we do in public education. Share your story like the story featured in this image displayed on the screen. There’s a lot going on in this image. 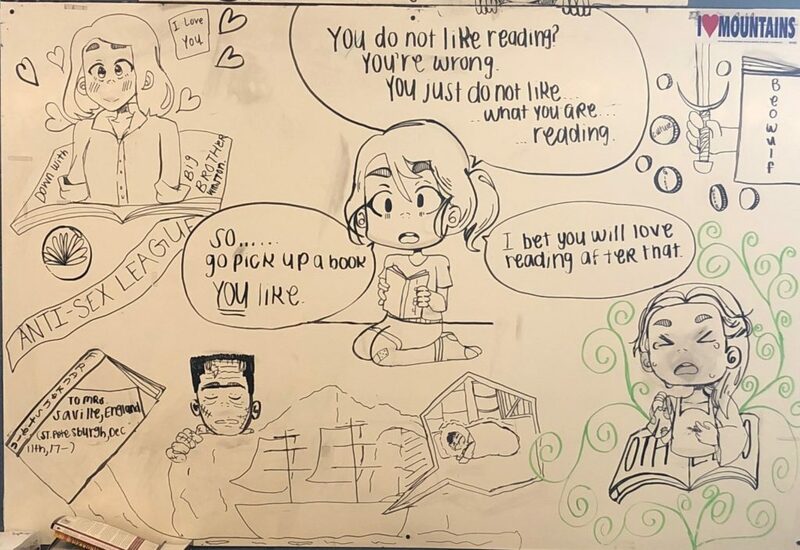 I was visiting a high school in New Castle County and walked into an English teacher’s classroom. This image immediately caught my eyes. And the story behind it will stick with me forever. Now I’m not saying things are anywhere near as dire here as they were in Mrs. Reece’s world, but just know that long ago the rights we take for granted today were hard fought by someone else, and it’s up to us to find the time and ensure we protect those rights. Thank you, delegates, and remember: Solidarity Now and Solidarity Forever.